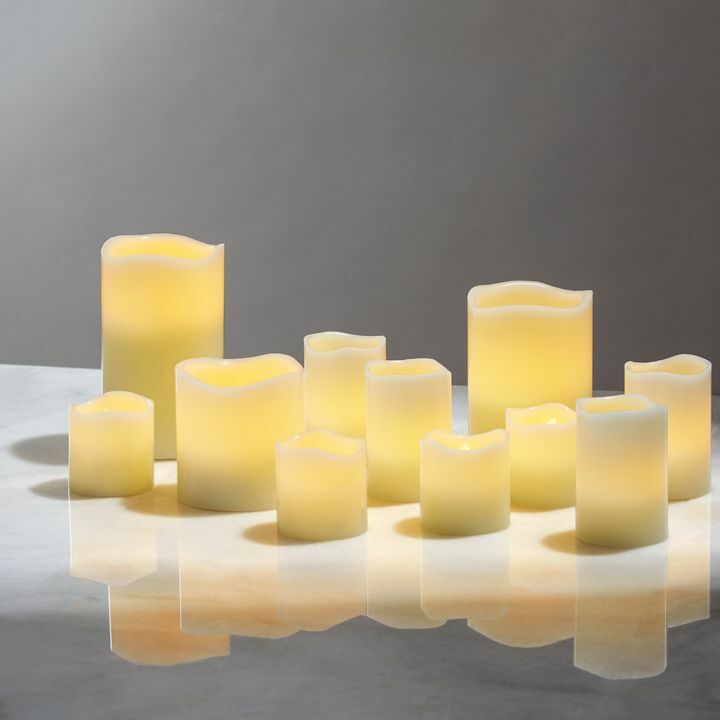 There are only 109 available of the Warm White Melted Edge Flameless Ivory Wax Votives with Timers, Set of 15. Your selected quantity has been adjusted. 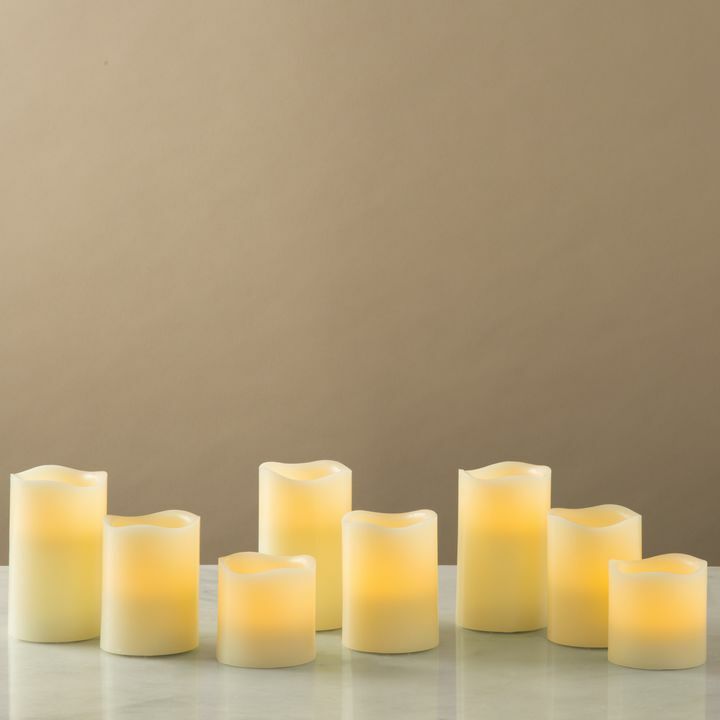 With their ivory wax exteriors, life-like melted edges and natural faux flicker, this assortment of votives mimics the warm ambiance of real candles without the worry of messy drippings or open flame. For your convenience, the set has a six hour timer feature. Switch to timer, enjoy hours of illumination, and the candles will resume lighting at the same time the next day. Perfect for home, weddings, churches, restaurants, and events. 3 - 2" x 4"
6 - 2" x 1.5"
The candles are exactly what I was looking for. They will be a part of my wedding centerpieces and then mantle and coffee table decor after. Thank you Lights.com! Bought one box and they are amazing! Just ordered two more boxes. The light is just perfect. When they are all on it is so pretty. Ordered on the 9thDec and received on the 15th Dec. The candles are gorgeous and it came with EXTRA batteries!!! Glows and flickers like a real candle. Worth the price and a bonus with the discount!!! These are wonderful! Perfect for our yoga studio! Bought this set for myself and look keep so much cheaper, found another place to use them AND got a set as a gift. Timer is so helpful and all the best Xtra batteries are a plus. Consider this set as a gift for friends. Better than what I expected. I am using to decorate for Christmas. TheyÐ²Ðâ¢re beautiful. Love the lights look and the feel of the lights. They feel like real candles. The best feature is that they are on a timer. I am terrible about remembering to turn stuff like this off. So far so good. The set is really nice but I have already lost two of the timers. Hopefully I wonÐ²Ðâ¢t lose anymore! If I donÐ²Ðâ¢t lose anymore I certainly would buy them again. I ordered these for a wedding I have coming in the fall and they are perfect! 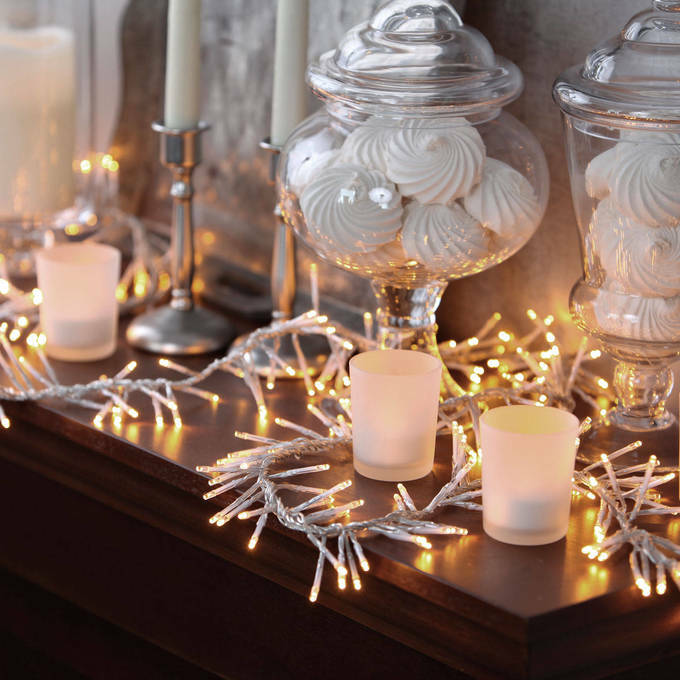 Feel like real candles and the flickering effect is perfect for the ambiance we are going for. They also ship extra batteries with the candles! Even better! Would definitely purchase again! Love my candles. Thinking about ordering more soon. Using at a wedding this summer. I am very pleased with my purchase of eight flameless candles with remote. I use them as nightlights and the remote is so very convenient when shutting them on or off. I would like to have these with timers but could not find any offered with timers. Couple of them have to be reset every few days to stay on the timer. I chose a wedding reception venue that only allows flameless candles and I wanted tons of candlelight for my reception. 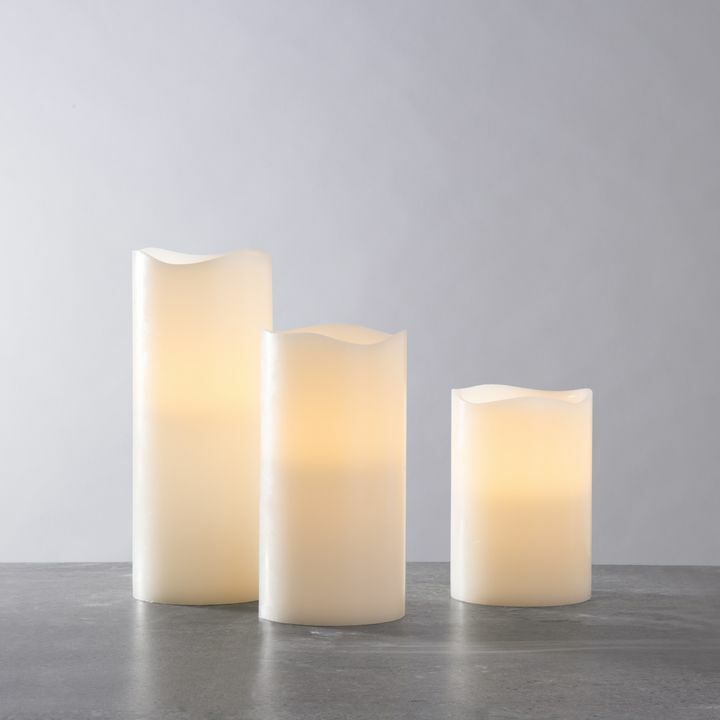 These candles give off the perfect amount of light and look a lot like real burning candles. 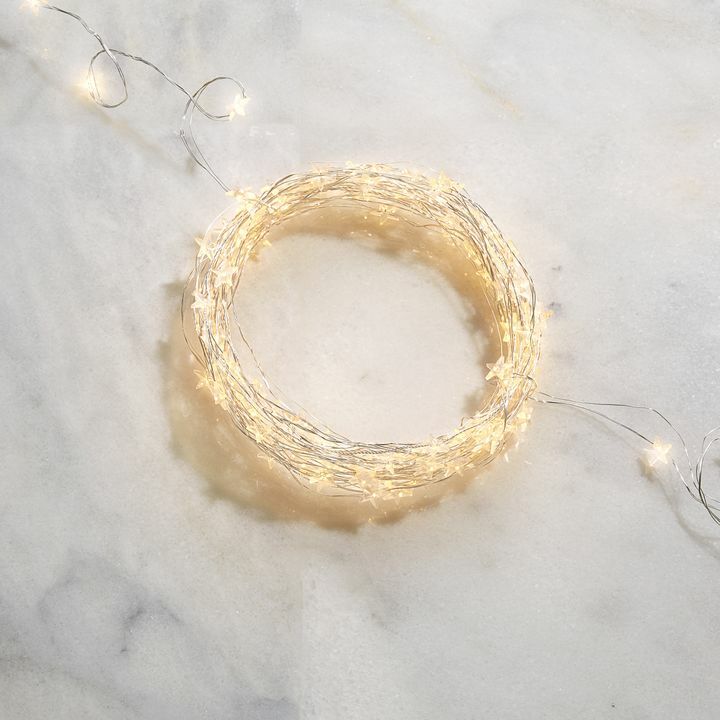 I have recommended Lights.com to my florist and other people I know getting married because of the quality of these candles. These candles are just the perfect addition to my patio hanging jars and lanterns on the deck. They give off the softest glow ---- perfection! Love them! 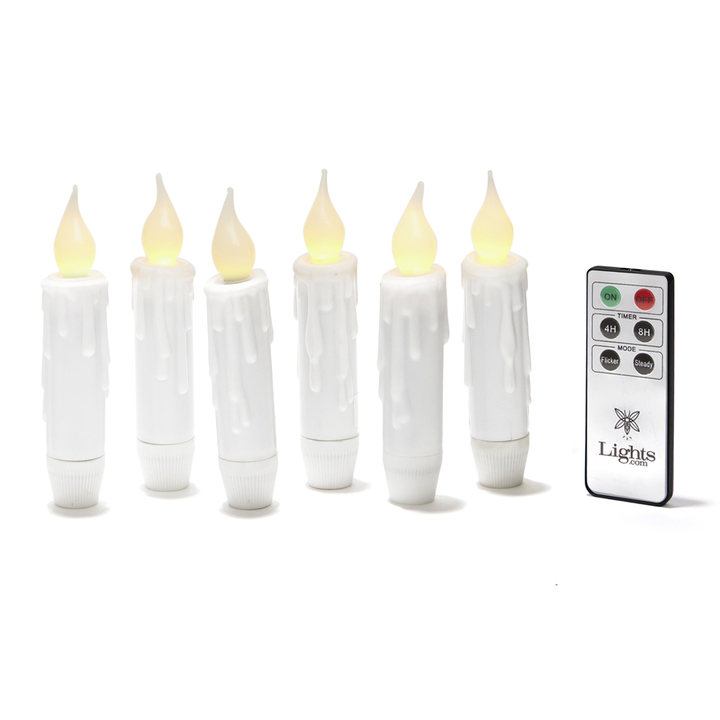 They flicker like real candles and they come with extra batteries. Very happy with the quality of the products. Very realistic flameless candles. Shipped very quickly. Going to use them in my wedding decor! These are great - I put them in places where a fire-candle could NEVER be safely placed. Inside my hutch, on cabinet shelving and window sills. For Christmas, I arranged them with additional Lights.com candles and created a holiday Cathedral. It is still going strong and being beautiful. Thank you! I just had some remodeling done and there is a cabinet with glass doors where I have made a display of crystal and there were no lights inside. I put several of the candles scattered about and it made a huge difference in the appearance, very pretty. I revived these and they are so so beautiful! Will be perfect for my wedding! I bought several of the pillar drip candle sets for my California wedding where actual flames are illegal. I tested them out just now and I have to say I couldn't be happier. The candles are beautiful, feel sort of waxy (like they are real), and the drip effect is perfectly so that it looks like an actual dripping candle. When I opened the box I was pleased to find it came with batteries. The remote is easy to use and also came with a battery. There are a good amount of settings for the candle including "light" (the candle just lights up) and "candle" (the candle as a flicker effect). If you pick "candle" there are several options there too. One lights up most of the pillar and the other dims it and only the top portion is illuminated. There are different speeds and patterns to the flicker on each of the two options under the "candle" setting. I can't wait for my wedding! I know these will look fantastic and they are various sizes and heights and when I set them to different flicker patterns and pulses they will look quite real and very beautiful. Love these. It was a real bonus getting extra batteries too. Love the different shapes and the fact that I can reuse them. We found these candles to be a great value. They worked great with the exception of one of the small ones, however customer service immediately sent us a new one. Great price, great service. 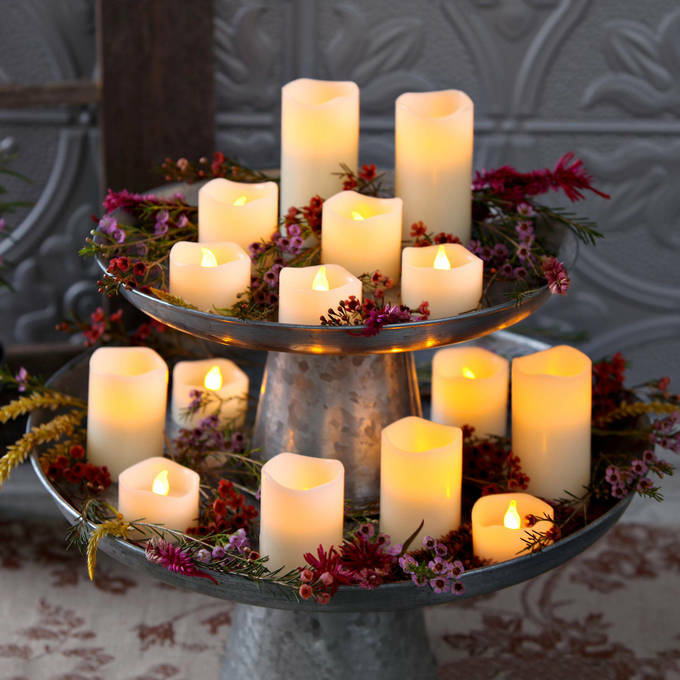 Does these candles come with the double decker candle holder shown in the picture? 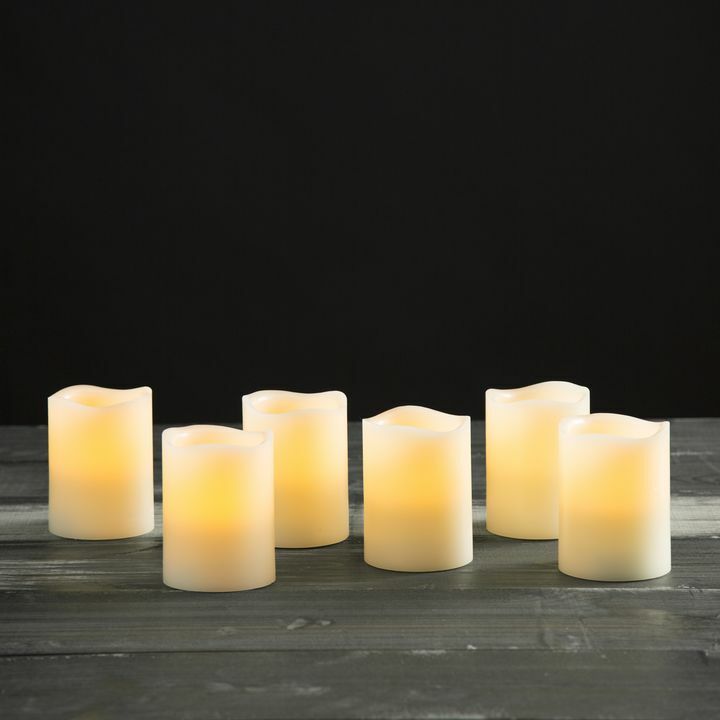 Warm White Melted Edge Flameless Ivory Wax Votives with Timers, Set of 15 does not come with the double-decker candle holder. 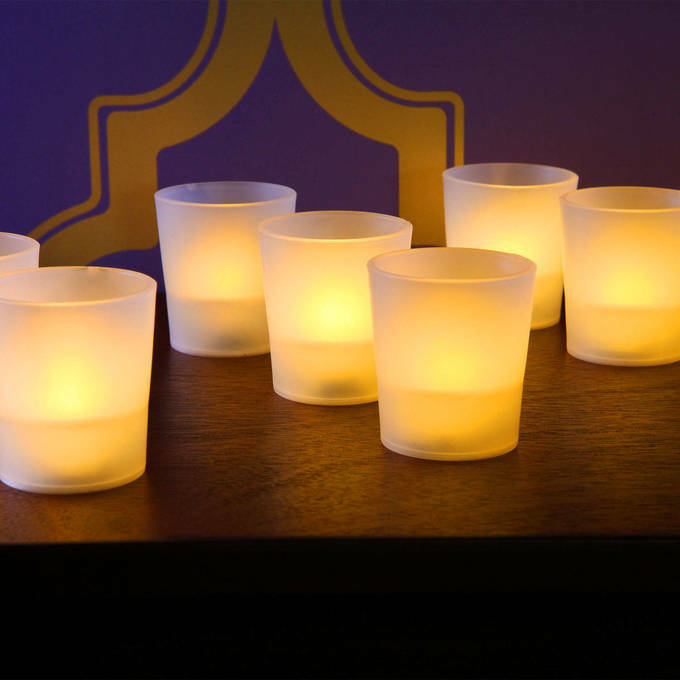 The Warm White Melted Edge Flameless Ivory Wax Votives with Timers are made from real wax and can melt in the sun, and they are not weather resistant. These candles are recommended to be used indoors-only. Can some of the candles be disconnected or do all 15 have to run at the same time? 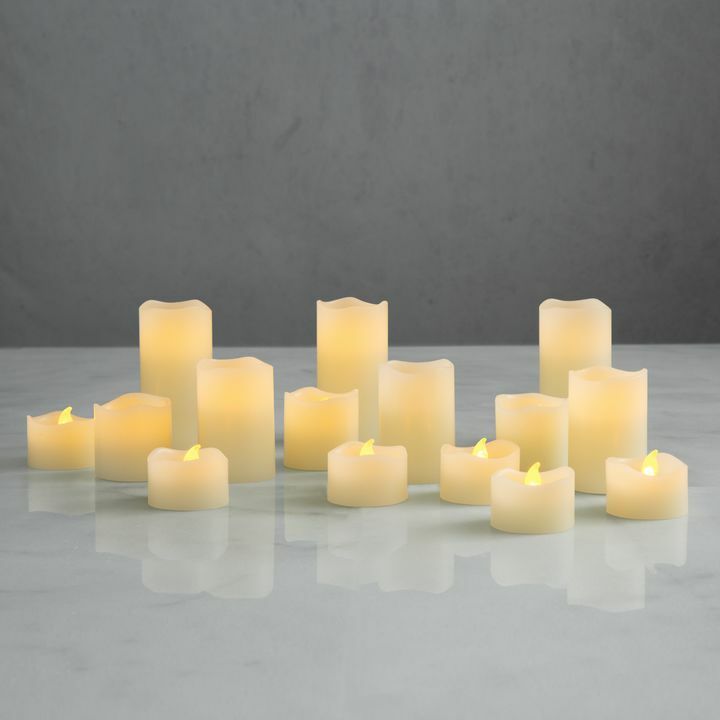 The Warm White Melted Edge Flameless Ivory Wax Votives with Timers, Set of 15, can be disconnected and they do not have to run at the same time. 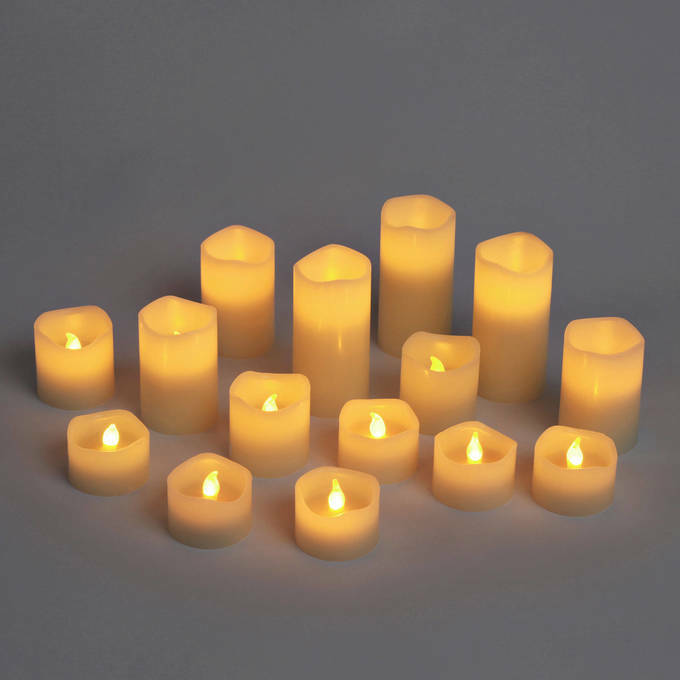 Do these candles have the wick/flame that moves as if a natural fire or is it a less real stationary flame? 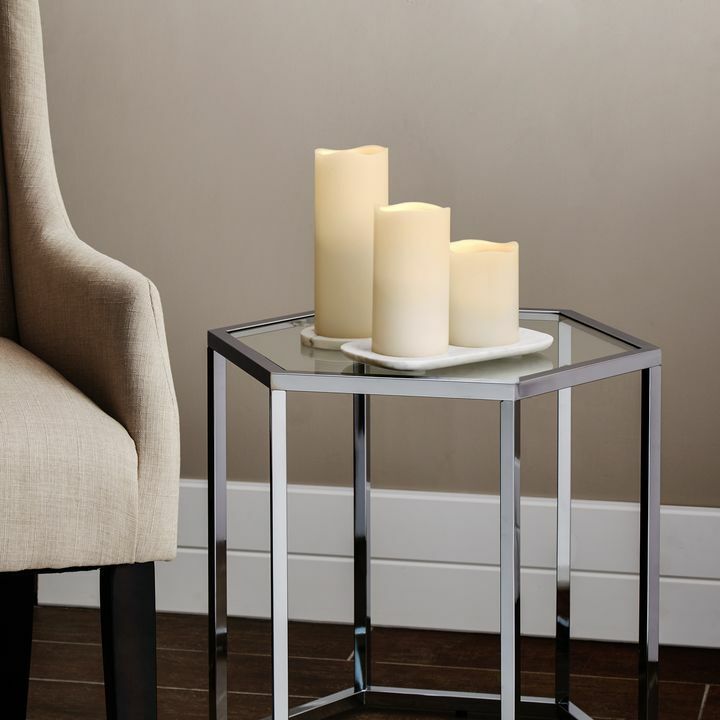 The wick/flame on these candles do not physically move but these candles have a soft flicker that is realistic to an actual lit candle. So once you turn the candle on, a 6 hour timer begins and shuts off automatically. When can the candle be turned back on again? It will turn back on the following day the same time you set them. 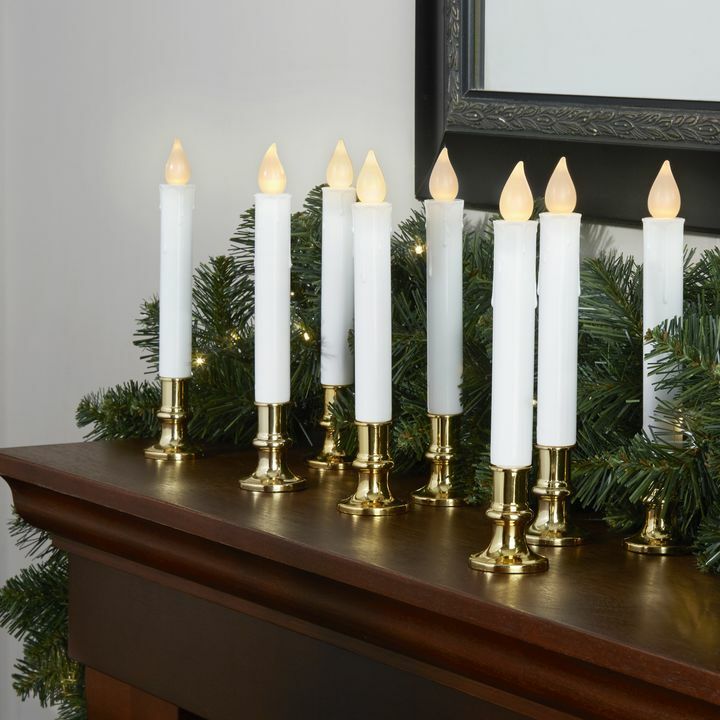 Is there an on/off switch plus timer for each candle - is there one primary that turns all of them on at the same time and sets the timer for all of them at the same time. Thank you. There's an on/off switch. When turned on the timer will start automatically from that time. Turning itself off after 6 hours. What batteries do each size take and whT is the battery life in each size? 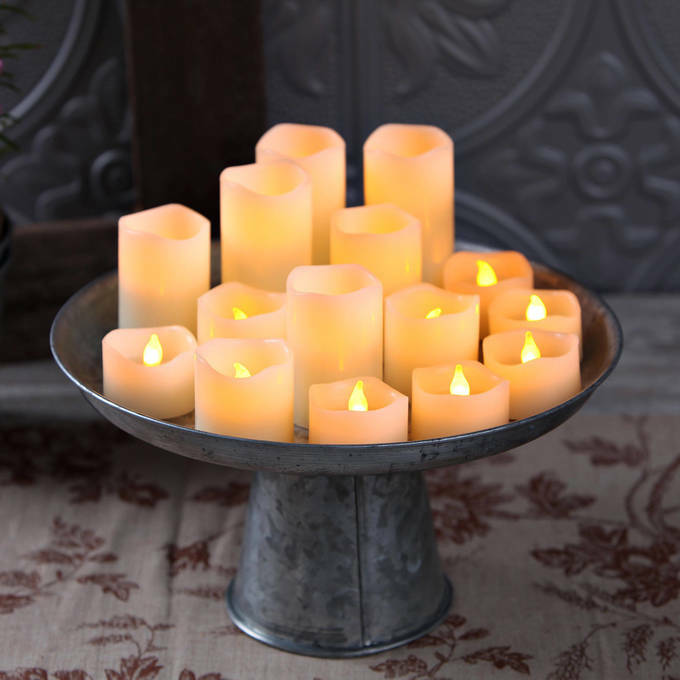 Includes 1 CR2032 battery per votive and includes additional 30 extra batteries. On average the batteries last about 45 hours. Can these be used without the automatic 6 hour timer? I'd like to leave on for about 8 hours. Will the battery even lady this long? Yes, the candles have an ON/TIMER/OFF switch. You can choose the On switch if you do not wish to use the 6-hour timer feature.